Produktinformationen "RealQ Plus 2x Master Mix for Probe - High ROX"
Quantitative polymerase chain reaction (qPCR) is the preferred method for gene analysis. RealQ PCR 2 x Master Mix is well suited for gene expression, genotyping, SNP analysis, pathogen detection, drug target validation and for measuring RNA interference. RealQ PCR 2 x Master Mix has undergone extensive validation to ensure high performance. 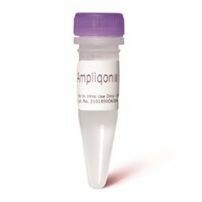 Our RealQ kits contain TEMPase Hot Start DNA Polymerase, green dye and ROX reference dye. RealQ PCR Master Mix 2 x for probe is also available. Weitere Artikel passend zu "RealQ Plus 2x Master Mix for Probe - High ROX"
Unser Kommentar zu "RealQ Plus 2x Master Mix for Probe - High ROX"
The ProbeMastermix is a ready-to-use 2-time mastermix that contains dUTP instead of dTTP and 500nM ROX™ (high ROX concentration) as reference dye. Hier finden Sie Informationen und weiterführende Literatur zu RealQ Plus 2x Master Mix for Probe - High ROX. Für weitere Dokumente (Zertifikate mit weiteren Lotnummern, Sicherheitsdatenblätter in anderer Sprache, weitere Produktinformationen) wenden Sie sich bitte an Genaxxon biosience unter: info@genaxxon.com oder Tel. : +49 731 3608 123. Kundenbewertungen für "RealQ Plus 2x Master Mix for Probe - High ROX"